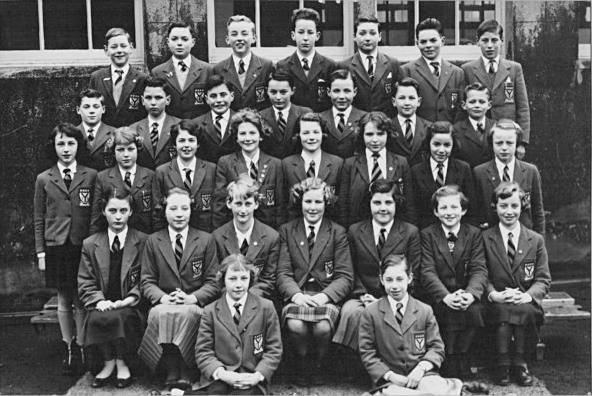 Ardrossan Academy Primary (could be Primary7 1960) - Source - Chris Shields. If you can add the missing names it would be appreciated. Back Row. Martin Byers, Briqn Jones, William Parker, Peter Grimley, George Sutherland, Douglas Bruce, Jim Gilmore. 2nd Back Row. Johnston Brodie, Matt Norris, Frank Behan, Jimmy Armstrong, Colin Wilson, Jim Hall. Middle Row. Lorna McColl? ......? Janice McCulloch, Linda Perry, Lorna Campbell, Anne....? .......? ........? Front Row ......? jennifer Gossman, Sylvia Gill, Sandra Beagley, Dorothy Millar, Shona McMillan, Carol Chicot. Sitting Front. Georgina White, ......Welch? I'm thinking 6th in from the left in the middle row could be Anne Allison (Anderson Terrace, Ardrossan) whose father was the burgh gardener. Much less likely, that 2nd in from the left in the same row might be Janette McLaughlan (Oak Road, Ardrossan).